Lately, we’ve seen a lot of frames in green nuances. It’s like a couple of years ago, when all the classic black frames became brown, and now they are turning into green. Green is the new brown? l.a. Eyeworks always has crazy shapes and colors. And now they have the craziest textures as well. It looks and feels like wood grain – feels very soft and natural – but its actual acetate! Even other brands, such as Vasuma and Theo have made wood-inspired frames. What do You think? 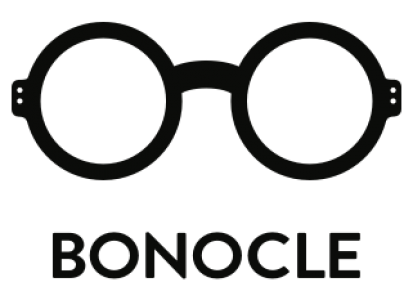 Bonocle loves it! Persol is a very classic Italian eyewear brand founded in 1917 and several of their glasses feature the characteristic metal arrow hinges. The name is derived from “per il sole”, Italian for “for the sun”. If you find a pair of vintage Persol it says “Ratti” inside the temple and the quality is wonderful. In 1995 Luxottica took over the production of Persol. One of Persol’s most important figures is definitely Steve McQueen, who wore Persol 714 with blue lenses in the “Thomas Crown Affair” in 1968 (See picture below). Additional fun fact: the custom pair Steve McQueen wore in the movie was auctioned for $60.000! Steve McQueen also wore another very similar Persol frame called 649 in his every day life. Steve McQueen wearing the Persol 714 with blue lenses in “The Thomas Crown Affair”. Photo from here. Steve McQueen in Persol. Photo from here. Marcello Mastroianni in “Divorce Italian Style” wearing the Persol 649. Photo from here. Persol’s 649 (see picture below) looks exactly like 714 but is not foldable. The 649 was made in 1957 for tram drivers in Turin who needed large glasses to protect their eyes from dust and air. It was made famous in 1961 by Marcello Mastroianni who wore a black pair in “Divorce Italian Style” (See picture above). We really like the 649 in tortoise and green-gray lenses also known as G-15 lenses. Very classic frames, you can rarely go wrong when buying this one. Persol sunglasses were James Bond’s only choice a few times, both Daniel Craig and Pirece Brosnan wore them as Bond. We could keep namedropping celebrities who’ve worn Persol but we think this is enough for now.